Ranchi, Jharkhand 29 May 2014 :: AJSU party meeting was Held in Ranchi. Party President, Sudesh Mahto with other senior leaders took part in the meeting. Rotary Club Ranchi South : New Rotarion Members training progamme. Ranchi, Jharkhand 31 August 2014 :: New Rotarion Members training progamme of Rotary Club Ranchi South was held at Hotal AVN Grand, Ranchi. Main speaker of the programme was Ajay Chhabra. Lensman :: Uday, Ranchi. Ranchi Jharkhand July 20, 2014 :: Samir Ashraf (Alpha Specialist) said that Sony workshop will make bridge between Sony and Photography. 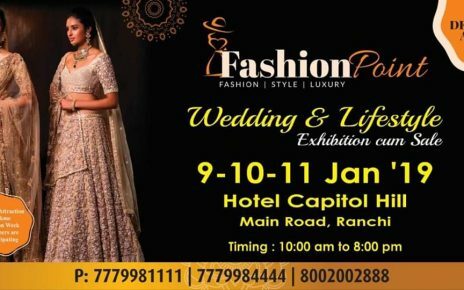 Wedding and Lifestyle Exhibition from 9th to 11th of January 2019 at Hotel Capitol Hill, Ranchi. MoU between Tribal Cooperative Development Ltd., Jharkhand Van Adhikaar Manch & Poorest Areas Civil Society for the effective implementation of Forest Rights Act, 2006 in the state.